After a tumultuous month in which the Pitt wrestling team underwent a midseason coaching change and dropped its first three conference matches, the Panthers hit their stride this weekend. No. 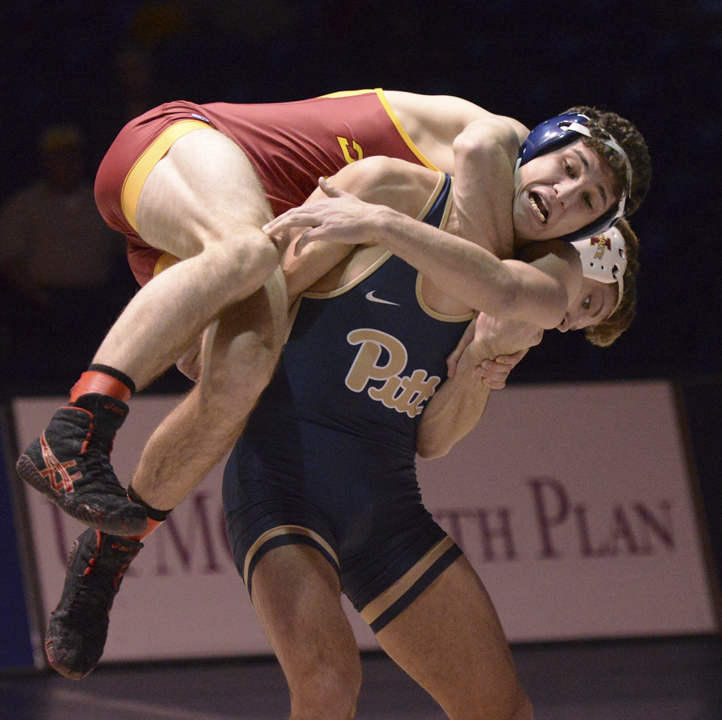 24 Pitt (10-5 overall, 1-3 ACC) went 2-0 over the weekend, defeating the Iowa State Cyclones at home Friday night by a score of 22-15, then besting the No. 23 Virginia Cavaliers in Charlottesville, Virginia, on Sunday, 19-14. Both wins came after a disappointing result against No. 8 NC State on Feb. 3, in which the Panthers fell just short of a massive upset in a 23-15 defeat. The 133-pounders kicked off Friday’s competition, as No. 8 Dom Forys took on the Cyclones’ No. 12 Earl Hall Jr. The two wrestlers met last year in the NCAA Tournament’s Round of 12 with All-American status on the line. Hall won in a 13-7 decision, but Forys exacted revenge Friday, winning 6-2. Headlee said defeating a returning All-American — especially one who already held a win over Forys — will pay dividends for Pitt’s top wrestler moving forward. Nick Zanetta followed Forys’ lead, defeating John Meeks in a 9-4 decision in the 141-pound match. Iowa State’s 149-pounder Gabe Moreno arrested the Panthers momentum just minutes later by pinning Pitt senior Mikey Racciato in the first period. Although Racciato generally comes out of transitional moments with the advantage, Friday night he could not regain his bearings. The Cyclones couldn’t celebrate for long, as redshirt freshman Taleb Rahmani picked up his team-leading eighth fall against fellow redshirt freshman Colston DiBlasi to improve to 17-6 on the season. After a lengthy first period scramble, the referees stopped the match for a score review, changing the board from 4-1 to 8-5 after counting previously missed near falls and takedowns. Subsequent a scoreless second period, Rahmani started the third from the top position and didn’t give DiBlasi a chance to escape, pinning his opponent 24 seconds into the final period. During the 165-pound bout, No. 11 TeShan Campbell had a major decision over Logan Breitenbach. The action-packed match featured Campbell scoring takedown after takedown and benefiting from three two-point nearfalls. At the end of the match, the Panthers were up 16-6 as a team. The Panthers won by a final score of 22-15 Friday, but had little time to relax after the win. Immediately after the completion of the dual, the Panthers began preparing for Sunday’s match against the No. 23 Cavaliers. With the heavyweights leading off the match Sunday, Pitt’s No. 20 Ryan Solomon grabbed a major decision over Virginia’s Tyler Love with a bout score of 11-1. Directly afterwards, Panthers’ 125-pounder Bentley fell to No. 8 Jack Mueller of Virginia by a 16-1 technical fall. Forys defeated Will Mason to move Pitt into the lead. After Cavaliers’ 141-pounder George DiCamillo defeated Zanetta, 9-3, the Panthers collected three consecutive wins by Racciato, Rahmani and Campbell. Redshirt sophomore 197-pounder Zach Bruce guaranteed Pitt’s victory, finishing the day’s meet with a one-point decision over Cavalier Will Schany. The Panthers finished their hectic weekend with a 19-14 win over UVA. The team’s next meet will take place on Feb. 18, as the Panthers will host the Duke Blue Devils at Fitzgerald Field House.